and having music classes in school, and the opportunity to form bands with his American classmates, Nagi found social mobility. In High School his teacher Christopher Stowens was a a pioneer in electronic music, and a contemporary composer. He encouraged Karim to be a multi-instrumentalist, to manage the school's music guild, and to utilize computers to produce music. After 3 college years of radio dj-ing, jam bands and thrash metal theatrics, the native Egyptian turned back to Arabic music in his senior year, permanently. He traded his drum sets for goblet drums, and his electric guitars for long neck lutes. He began producing local world music nights in the famous Cafe Lena and Falstaff's in Saratoga Springs NY. It that period he was discovered by thespians, who invited him for a residency in the Williamstown Theater Festival to make live musical accompaniment for their avant-garde productions. Soon after, Karim released his very first album (a cassette) of Arabic and World percussion music, with spoken word and sound design. At age 23, Karim Nagi was ready to return to Egypt and coalesce his study in Arabic music. While in Cairo, Nagi discovered that some members of his doctor family were secret artists, who in turn helped him find instrument and poetry teachers, plus take him to esoteric music rituals. With Cairo as his new home base he toured the newly opened Eastern Europe with a Michael Counts theater troupe, followed by Turkey with an extended hovering around the Whirling Dervishs of Konya musicians, a driving tour of Tunisia, and concluded with a 4 month religious festival tour of South India. But most crucially, in Egypt he accumulated hundreds of hours of private music lessons. At age 26 Karim Nagi resettled in the USA, managing his mother's two clothing boutiques in Boston, while developing his music career. He quickly located all the elder expatriate music experts and helped them form a group, performing Egyptian, Syrian and Lebanese repertoire using all traditional instruments. These elders had a "suspended in time" old school music approach, and influenced Karim in everything from his song choices and his percussion style, to his way of dressing. Simultaneously Nagi rediscovered his college DJ love, but this time for clubs, not radio. He developed Turbo Tabla, his own remakes and remixes of Arab music with House and Trance beats. In that time he made live electronic and percussive music for 16 fashion catwalk shows. Karim continued to maintain this parallel traditionalist and hybrid innovation approaches for his entire career. In the following 18 years, Nagi recorded 12 albums, 5 instructional DVDs, 5 music videos, with performances on 5 continents. His Sharq Ensemble brought Arabic retro-style Arabic music to places ranging from the Smithsonian Museum in DC (performing under a Renaissance mural), to the Milwaukee Arab Festival (performing under a Miller sign). His Turbo Tabla electro-Arab CDs were distributed by Universal Records, and were in the listening stations of Virgin and Tower megastores. He made extended guest appearances with early music groups like Boston Camerata, and Boston Revels. Also inspired by his experience at folk music venue Cafe Lena, Karim continued to produce a world music series at the famous Club Passim. He also took an adjunct faculty position at New England Conservatory, teaching Arabic percussion and ensemble classes. All of these activities taught Nagi the importance of community building, and cross cultural exposure. After 9/11, and the ensuing polarization between the Arab/Muslim communities and America, Karim used his music and events to help alleviate the conflict. He visited over 300 schools across America with his Arabiqa program, giving cultural performance demonstrations to young audiences with little exposure to Arab people. He also went on a wide campaign to promote Arab dance by teaching and performing in dance festivals around the world. This global campaign brought him performances and master classes in Taipei, Singapore, Shanghai, Seoul, Osaka, Bogota, Panama City, Mexico City, Katowice, Maribor, Verazdin, Montpellier, Venice, Frome, Montreal, Saskatoon, and countless American cities. Karim's newest project "Detour Guide" is an equinox of all he has learned and gathered: the traditional melodies and rhythms of Arabic music, the spoken word and storytelling of Theater, the remixing and soundscaping of the DJ, and the joy and kinetic energy of Dance. His verbal oration allows him to speak about the timely topics of Revolution, Identity, and Self Respect that both Arabs and non-Arabs face today. His percussive prowess keeps each song groovy and endurable. Using English and Arabic, he continues to merge worlds, communicate, and celebrate pluralism. "Detour Guide" is the synthesis of both his social message and his artistic strengths. And he expanded his traditional Egyptian family's career demographic in the process. Think of it as an alternative tour of the Arab world. There are no ancient pyramids or great mosques here, no Hanging Gardens of Babylon, none of the towering history of the Pharaohs. This tour is strictly 21st century, the time of Arab springs, of mass migration, of globalization and beats that go around the world. A time when everything believed before has been shown to be wrong. It’s the right time for the Detour Guide (release Oct. 23, 2015), and Karim Nagi understands that. He’s been there, he’s lived it. He’s already played it. Born in Egypt and raised in the US, Nagi has moved back and forth between countries before finally settling in Boston. He’s absorbed the highs and lows of both cultures on a cellular level, and knows the power of humor is a good way to get his message across. Nagi enjoys debunking myths on Detour Guide. “Your First Arab” and “What Arabs Do For Fun” take glee in puncturing so many ideas about Arabs and their world, while “Baladi TukTuk” looks in the other direction at a young Arab who’s returned home after discovering U.S. cities aren’t paved with gold. Nagi has often spoken about Arab culture and identity over the years, lecturing to students in schools and colleges, including Harvard, Yale, and Princeton. He understands the similarities and differences between us all. That’s not an easy balancing act, but Nagi definitely succeeds. Much of that is due to his long experience in the studio and on stage. Under the name Turbo Tabla, Nagi has released a number of CDs reimagining Arabic music with house and trance beats, while he also regularly DJs, as well as leading the more traditional Sharq Ensemble and teaching Arab percussion and dance. Nagi also plans to perform Detour Guide in its entirety at concerts, something he believes will heighten its impact. 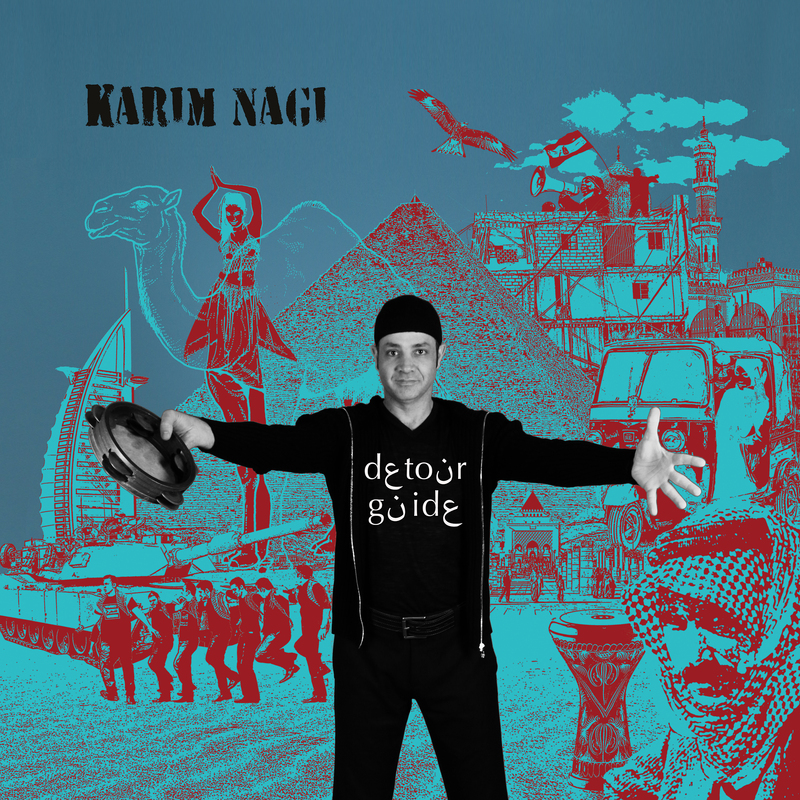 Karim Nagi will perform Detour Guide at the absolute most compatible venue; Global Friday's at the Arab American National Museum, Friday December 9th. Dearborn is home to the biggest Arab diaspora in America, and the AANM is where they gather for new music. "It will be a unique concert with storytelling and multimedia. I will use my drum to keep everyone energetic and engaged." But that’s the plan for the future. More immediately, Nagi will be appearing as one half of Tarabists on September 26 at the YMCA Theater in Cambridge, Massachusetts, along with Amer Zahr, a Palestinian-born oud player and comedian.